Have you been enjoying watching the 2010 Olympics? I have...snuggled up with a blanket and a cup of joe in hand. Also, with a box of kleenex and a ton of cough drops near by. I've had this darn cold since Sunday and I really haven't felt like doing much - design productivity that is. I have a few projects that have been brewing in my head so I WILL work on them this weekend. 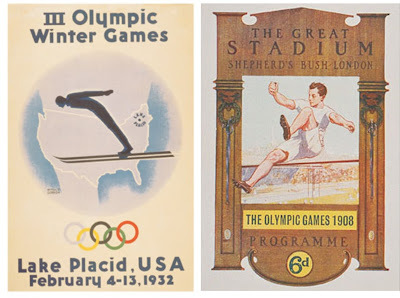 Thinking about the Olympics I was curious about the designing of posters and etc...for the event and found this website that shows the posters of the past Olympics. If you have time to browse they are neat to look at.